Panasonic's Public Sector Service Toughbook Bundles are designed for the unique requirements of Fire, EMS and Police Departments. With Public Safety mobile workers so dependent on their computers, every hour of downtime can be expensive or even catastrophic to public service. By enhancing your Toughbook® laptops with Public Sector Service Package you’ll get services tailored to fit the unique requirements of your government agency. From deployment, to warranty and repairs, all the way through end-of-life of your device, Panasonic will be there to support your team. Panasonic’s Deployment Services ensure that your Toughbook® laptops arrive in the field ready to work and customized for your environment. It begins with stress-testing systems for a rigorous 48 hours, validating your image for maximum capability, loading your image onto systems, integrating third-party accessories, asset-tagging every component, and producing reports filled with configuration and deployment details—data that you can feed into your asset management system. Your units arrive imaged,assembled, charged, tagged, and documented. Panasonic’s field engineering team will meet with you regularly to review service history, analyze trends, and consult on the latest changes that apply to your systems. A current copy of your image is kept on file at the Panasonic National Service Center, allowing our technicians to quickly and accurately re-create any issues experienced in the field. If a replacement hard drive is required, the current image is deployed prior to delivery. Once your devices are being utilized in mobile work environments, we know accidents happen and that is why Panasonic provides prompt repair or replacement of all major computer parts at no additional cost. And in cases when the damage is beyond repair, we will replace the entire device. With the Public Sector Service Package, your workers experience minimal disruption, and your IT staff is not sidetracked with surprise repairs. Additionally, your finance staff will be happy to know that they’ll never need to worry about funding unexpected repair costs (even for minor repairs) after deployment. This helps them budget entire projects without those surprises. organization’s sensitive data, simplifies the technical support process for your organization’s users, and reduces administrative costs associated with getting hard drive replacements out. 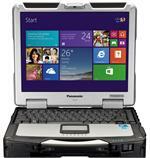 When your Toughbook® laptops have served its useful life, Panasonic is there to help with end of life processing. Our team will consult with you to capture any remaining value in the devices, and/or provide asset pick up, recycling, and disposal services. All included with your Panasonic Public Sector Services Bundle. Toughbook 31 mk5 Public Safety Bundle - features include Intel Core i5, 13.1" XGA Touch Display, 4GB, 256GB SSD, 4G Modem and Emissive Backlit Keyboard.